He is a big-picture thinker and innovative psychological theorist. Jay is known the clarity of his teaching and writing, his creative methods ofdemonstrating complex ideas, and his detailed description of therapeutic technique. Jay focuses on Internal Family Systems Therapy inall aspects of his work. He teaches courses applying IFS and the Pattern System to specific psychological issues such as procrastination, communication, relationships, and the inner critic. 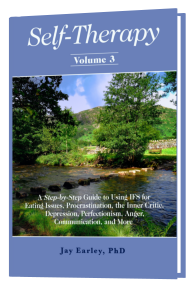 Jay has published other books on IFS, including Freedom From Your Inner Critic, Resolving Inner Conflict, and Working Through Anger in IFS. See personal-growth-programs.com. Jay has created the Pattern System, a systematic approach to understanding your personality that can lead directly to psychological healing and personal growth. He has published a series of books based on the Pattern System. See pattern system.com. Jay has created Self-Therapy Journey, an online tool for exploring and resolving a wide variety of psychological issues and developing healthy capacities. See selftherapyjourney.com. Dr. Earley is nationally known for his innovation in the group psychotherapy field,published in Interactive Group Therapy: Integrating Interpersonal,Action-Oriented, and Psychodynamic Approaches. He continues to lead interactive and IFS therapy groups in the Bay Area.Jay has also published Transforming Human Culture: Social Evolution and the Planetary Crisis and Inner Journeys: A Guide to Personal and Social Transformation. He is a former computer scientist.